He is the leader of the opposition in the Tamil Nadu assembly. Alcohol cannot do any harm to him. He is the one who harms alcohol all the time. He was always chased by heroines on screen for his out-of-the-world handsome looks. He can even make Arnab look like a Bagishan Dheeviravaadhi. He is also a brilliant man who is eternally confused between Hindi and English. Watch this video where Captain show's his Hinglish skills. He has ruled this country for ten long years. If you have doubts on that, we can have another news hour debate on that topic. 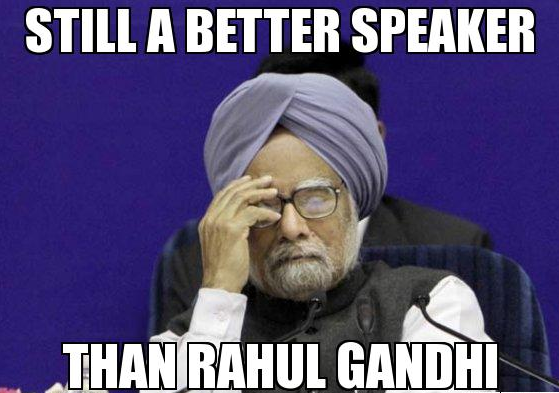 But in my opinion, he is the brain behind the 1991 LPG movement under Rajiv Gandhi's regime. This man can single handedly torture Arnab with his silence. She is for the TRPs. She comes under the barking dog seldom bite category. She has her own fan base ranging from 10 year olds to 90 year old men. She would single handedly make a majority of viewers to fixate their eyes on her during the entire debate. (Remember! Our main aim is to shift our focus away from Arnab Gowsami). I am not adding any picture of Poonam Pandey here. A movie will be a treat to watch only when it has unexpected twists and turns. Unless and until we have a conspiracy specialist in a panel, any debate will be soora mokkai. Swamiji is the best candidate to fill that spot. He is an exposing specialist. He can prove that Sonia Gandhi is not Sonia Gandhi. Unlike TOI which exposes the cleavages of human beings and Gorillas, Swamiji is an expert in transactional analysis. He can single handedly make the interview interesting. No wonder he was a regular at the Newshour when UPA Government was at the helm. This is a short clip of Subramaniam Swamy throwing his gyan on the longest typing mistake. He has lightened up the commentary box with his one liners. He has electrified the fourth umpire sessions with his shaiyaris. He has entertained the members of the assembly. Siddhu Paaji is the right candidate to liven up the show with shayaris when ever the discussion loses its charm. If Arnab Gowsami can make room for some cheer girls in the set, Paaji can also shake his leg and show his moves to the entire Nation that does not know what it wants to know from the Newshour. If you do not know him, you are not worth to live on this planet. He is a brilliantly talented man who is teased by many people in social media for his actions. I respect the talent he has. But his actions make me laugh. See this short video. This video single handedly makes him the most eligible candidate to be on the news hour show. Finally, the man of the monet. He is an automatic entry into the panel, because he is the only one who has completely tuned himself for the Newshour debate. Substitute: I have Swami Nithyananda as the substitute to fill any of these role, just incase someone does not turn up for the news hour. How ever as Swami is busy with his Yogas and Asanams, we request the TimesNow team to plant hidden cameras in Swami's room so that he can show a full fledged performance at the news Hour. Arnab Gowsami! 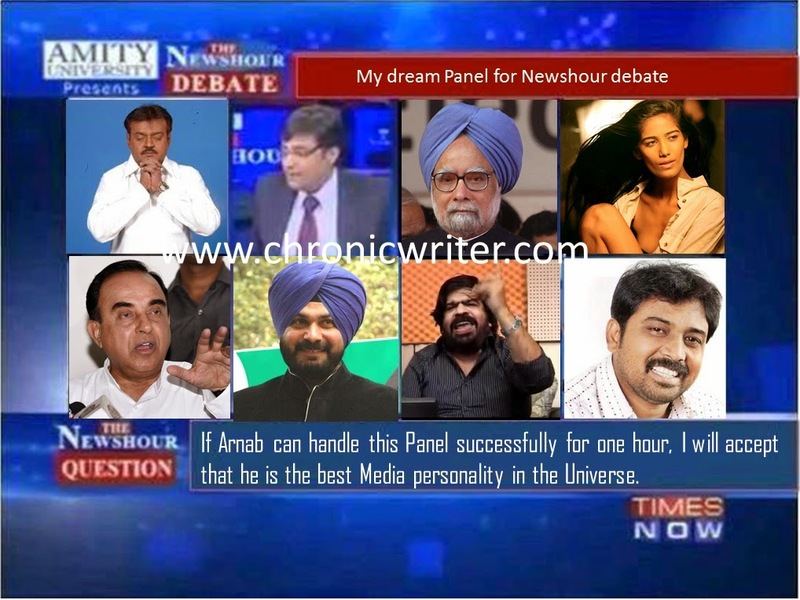 The Nation wants to know, if you can handle such a panel. If you have the guts to handle such a panel, I will close this blog and join kekran Mekran company in Dubai. 676. What's in a Cleavage? 674. Why was Saeed Ajmal banned?